Over a hundred locales expelled Jews before “Zionism” was even a factor. Why? – I Know it's Crazy but…..
Ed note Trevor–There is a large disinfo campaign which was started by “the good Torah Jews” to attempt to convince gentiles that Judaism was NEEEEVER a problem, and it wasn’t until “zionism” was invented that all the trouble began. (Can’t you just hear Rabbi Weiss’ loud, high pitched voice in your head right now?) That just might be the mother of all lies, and there is minimally 1800 years worth of history of Jewish expulsions, by diverse peoples of diverse ethnic backgrounds, that PROVE this is simply not the case. 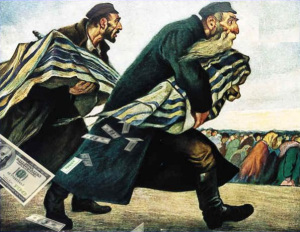 It looks like “the good Torah Jews” are a bunch of liars just like the “zionists,” and they are willing volunteers to act as a Jewish supremacist version of “human shields” for the other “bad” Jews, making sure that gentiles with blame everything but Judaism for the world’s problems.